From Donna Karan in New York, through Prada in Milan and to John Galliano in Paris, the 1940’s has been a clear trend for the Fall/Winter 2011 season. Starting in New York, Donna Karan’s show was full of Pearls, cinched waists and hair Bun’s, leading on with a neutral clean color palette. It felt like a fresh of breath air compared to all the other shows from NYC, it was needed. This season Karan has gone for a softer structure to the garment, opposed to her usual bold and defined shape. With Erickson Beamon designing the pearls which felt as the core of the collection, it came to no suprise that she named it ‘Pearls of Wisdom’. 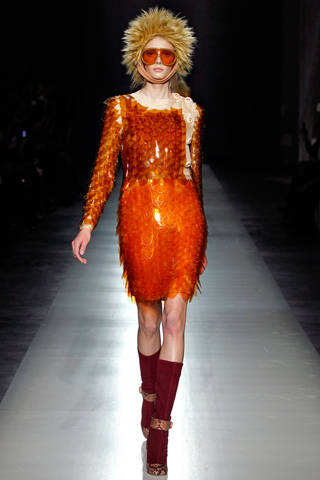 Miuccia Prada was giving a clear message this season…..it’s all about the coat. The Minute the first model landed her Mary-Jane styled Python boots onto the two floored runway, it was obvious she was a Forties girl. Almost like she had just stepped off an airplane. As the color palette grew to a wider variety, we started to see more and more different fabrics used. Faux fur, being a big trend this season, was brushed and brushed to give off a fun and flamboyant look. Sequins closed the show giving off a fish scale look. She always knows how to please her crowd! John Galliano was not present at his Fall/Winter 2011 show, but his designs sure made you feel he was. With a collection of only twenty looks, he was still able to squeeze out a Forties feeling. Starting off with Karlie Kloss wearing a tailored jacket with a wool pencil skirt and egg shaped top hat, it may not have been as styled as his previous shows, but it still gave off the Galliano effect. The collection may have given you the forties vibe, but the fabrics certainly did not. Like Prada, John used fabrics that you would not consider to have been apart of the forties era, like look two when a simple fur collared jacket was paired with a cream latex skirt or chains wrapped around the waist as a belt. It’s just the John Galliano touch.